What version of PGA do you currently own? I DON'T OWN A VERSION BUT WOULD LIKE TO! This thread will be used to help all PGA Golf owners bring back all of the lost extras (courses, players, etc) of their machines after Global VR's servers went offline years ago. IF YOU HAVE BEEN READING ABOUT PGA TOUR GOLF BUT NEVER BOTHERED TO BECOME A REGISTERED USER HERE...DO SO NOW AND JOIN IN ON THE CONVERSATION!!! Thanks to the massive efforts of member "bootsinallovryou" our PGA Tour Golf machines now have the ability to connect to an online server allowing us to compete against one another on tournament leaderboards.! A step by step tutorial to enable tournament mode for these machines has been provided by member "Spitfire" and is posted below. You can read how this started and track current progress starting from page 13 (post #499) of this thread. To join in online you need the latest patcher_04 linked below and a regular team challenge machine. No other machines will work. On the attract screen run the patcher in your cd rom drive. Once it says press any key to continue turn off and power up your machine again. Once back in attract mode go to the operators menu by pressing the red operators button inside ur cabinet. Be sure to have your machine connected to the Internet by plugging in an Ethernet cable directly to your cabinet Pc ethernet port. If you are using wireless be sure to configure your wireless connection as per the instructions before trying to register. Choose register/connect option, register cabinet and register your machine using the 4 digit code option using any four digits as it doesn't matter. Make sure you change from Dial up to cable adsl option and follow on screen instructions and allow the machine to call server. This may take a while first time to get to 100% complete. Once registered choose the force a call to the server and exit to game option and that's it. You should now be tournament enabled and online. To play online in a Tournament or the World tour option on your cabinet You will need a players card and reader. You will also need to turn your machine off free play otherwise you won't be able to select World Tour and Tournament on the start screen. This has to be done in the operators menu by choosing machine and settings option and disabling free play. Once you select World Tour it will ask you to insert your players card. It will say that the card is not tournament enabled and will run you through a number of steps to make it so follow instructions and your card will be made tournament ready and you will be given a player number. Now you can use your card or number on any machine linked to Boosts Server and your home made player can be used to play every course on the game without having an all access pass. You will be able to unlock hidden skill shots on every course to unlock special player customising items and equipment. Once all courses available on World Tour are played you will be given a player ranking and it will also unlock heaps of customisable clothing and equipment to use on your player in the Game face option of the game. You can also keep track of how many skill shots you have found and your ranking by inserting your players card into your card reader on the attract screen of the game. There are now also leaderboards available so you can show the world you are the best player out there. All this is thanks to are Legend known us boostinallovryou!!! without him none of this would be possible! Offering commercial grade vinyl decal printing for cabinet side art, control panel overlays, monitor bezels, marquees, etc. So my most recent idea involves utilizing the space where the mini marquee sits (above the screen and below the main marquee). 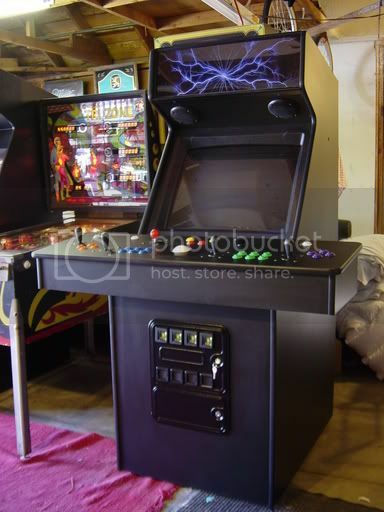 My original thought was to remove the mini marquee and install a 10" LCD screen in there and connect it to a webcam that was hidden somewhere in that area as well. I suppose you could even bracket a laptop computer that has an installed webcam. This would allow you to see your buddy and carry on a live conversation while you are playing them via tournament play (when that gets rolling). Then I thought it may be very easy to purchase a mount for a tablet with a front facing camera (Ipad, Galaxy, etc.) and slip the tablet in the mounting bracket in front of the mini marquee. If you launch Skype, Google, etc. you would be able to do the same (have a webcam experience) without having to mount an LCD and a separate webcam. You could also remove the tablet when not playing so that the mini marquee remains in tact. You could still play against a friend without connecting to their machine. 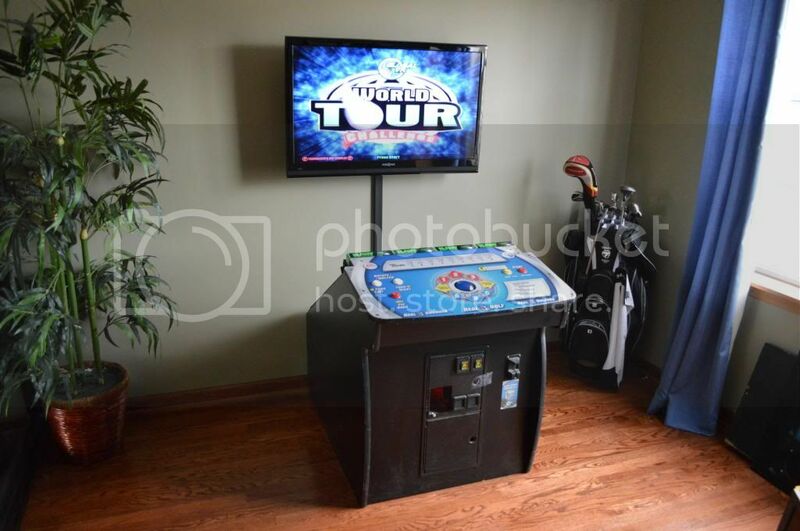 Although this option would not be AS FUN as playing online LIVE you could still play against someone else and keep a manual score hole by hole by connecting to video chat with your mounted tablet that's on your PGA cabinet. You could even pull the tablet out and face it to the screen to confirm a score if need be. It would be a blast to see the facial expression of your friends while being able to carry on a conversation without them being there. So now I'm looking at install brackets and going to test it out. Hopefully it works as well as I think that it could. I am thinking of making my own personal intro for when the game is in attract mode. Just need to create video, rename it, and see if it runs. Also thinking storing my personal player as one of the pros. I thought its my game why not. That sounds awesome. I would love to throw in a custom video with a custom sound track as well. If you do this could you post a tutorial so others could do the same? I would like to have my personal golfer as a pro too. Thanks so much, Ed. I appreciate all your efforts and support! I am going to have to get my hands on tiger woods 04-06 as from what I have been able to find online this arcade game is direct port. Exact players, courses so am thinking we should be able to cut and paste to add. Also can you hook up your pga HDD and look arount with nvidia thumbnail viewer (seperate program to look at ddl files). I am not going to be near a computer for next few days and want to see if this works. Also there is a site coursedownloads.com that is dedicated to adding courses to different ver of tiger woods golf. Hope this sparks some interest in others with PGA GOLF. Here are some pics of the gutted PGA cabinet that I hacked into a pedestal cabinet. 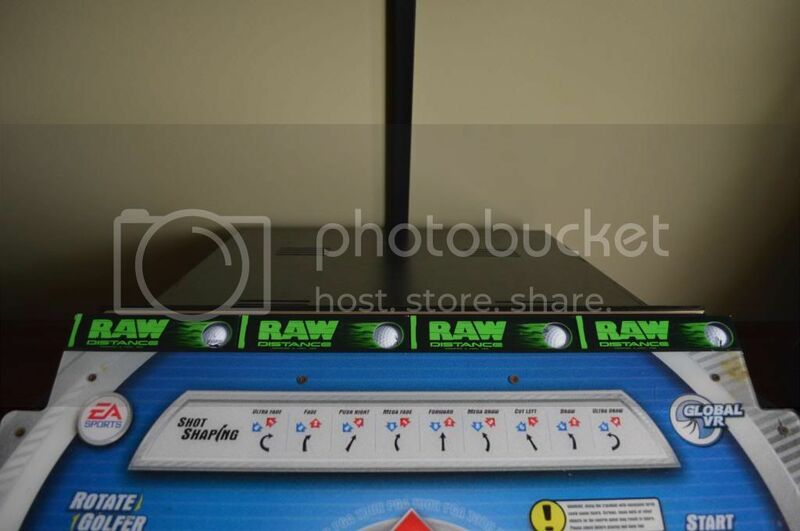 I also went with an illuminated blue trackball and have a little shelf that houses sleeves of golf balls on the top side of the control panel for a little extra personalization. I still have to install the lock on the coin door (tape holding it in place now), clean up some rough edges, give everything a fresh coat of paint, and install a NOS control panel overlay and then she will be all set. I hear you on that one! #1 Anyone up for a "low score" competition? We can all play the same course and put the difficulty on NORMAL (no mulligans). We can post screen shots of our best score over 18 holes. Just a way to have a little fun for now. #2 I never realized that pressing the "SHOT TYPE" button during the number of players screen or course selection screen can change the difficulty for you. I had always went into the service menu to do this (LOL!). Now I'm wondering if I'm missing some other rather obvious things in this game. Anyone else have one they would like to share? I stumbled upon my little find by mistake. Sounds great about the comp mate. Ill be in once I get a new graphics card in machine as mine has ---steaming pile of meadow muffin--- itself. I also have noticed that if u press I think it's shot type or start once shot is in play , it will speed up the shot in flight so u get through ur round much quicker. One of the buttons also will allow u to show a reply of the shot that u have just played aswell. I went poking around within my TEAM CHALLENGE hard drive today and after having a conversation with yukonblaze I was able to change some of the music in my game. So now when I press start I have Stone Temple Pilots playing during my game select, player select, and course select screens. Pretty cool way to customize your game a bit. I took the hard drive out of the PGA TEAM CHALLENGE computer and connected it to my desktop with a USB to IDE adapter (versus having to slave it in another enclosure) before doing any modification to the files. It was so easy to connect to my computer this way! I bought the cable from Amazon for $19.47 and it saves me a bunch of time. Here is the link in the event you want to grab one. I took my Stone Temple Pilots mp3 and converted it over to a wav file in order to replace the wav file in the game. The wav file that is currently in the game is 24.6mb and my new file was about 45mb. Then it was time to swap my music files. To do this I went into the "pga_tour_golf_2006" folder, then the "Shell" folder, then the "music" folder to find a wav file called "shell_music". I deleted that "shell_music" file and renamed my Stone Temple Pilots mp3 to "shell_music" and pasted it in place of the file I had just deleted. So essentially I deleted the original wav file and renamed a new wav file with the original name of the old wav file. Now I have Stone Temple Pilots playing in my PGA Team Challenge! If you have any questions please feel free to ask and I will help you the best that I can. I just picked up a Championship Edition 3 game a few days ago. The game does not have the card reader (hole is covered with a plate). Everything seems to be working except for the light behind the marquee (bad starter or bulb I guess). I still need to clean the rollers/bearings on the trackball. What is needed to upgrade this game to the Challenge version? I don't have any of the backup discs or other discs that were supposed to come with the upgrade kit when my machine was converted. Is the game dongle a white piece of plastic that plugs into a printer port? I sent you a PM. The dongle is the adapter that plugs into the printer port. Each version of PGA has its own specific dongle that is required for the game to be playable. If you would like to upgrade to "Challenge" you would need the Rescue CD and Install CDs as well as a "Challenge" version dongle. You would not be able to use your Challenge III dongle to upgrade to Challenge unfortunately. Hey everyone...what version of PGA do you currently own? I'm running Team Challenge. There is a poll at the top of the thread if you care to participate. I picked up a Dell Optiplex GX260 computer this weekend and I'm attempting a fresh install of PGA on the computer's stock components. It's going through installation now so it will be interesting to see if this older Dell can be a quick replacement for a bad Global VR computer. I will post some results as soon as installation is completed. ***UPDATE*** The game installs but hangs on the course loading screen after seeing the "CHALLENGE" loading screen upon rebooting. I will play with this a little more and see if I can get it to work. if u still want beta-brite s/w ? Ed, I will keep playing with it. I actually was able to contact paulstevens (member here who posted in your PGA thread in its early stages) since he was able to get a Dell Optiplex to run PGA. If you have a spare moment to post those card reader drivers with a breif explaination on how to install them that would rock the house. I really want to create a player but the reader isn't recognized by my PGA for some reason. That would be a big help indeed. I finally installed my betabrite led topper. However all I get once installed is betabrite advertising but no game stats etc. when I test in the diagnostics it doesn't show anything like the cable isn't connected?? But it is. Any ideas? Might my install of team challenge all access pass not have the drivers or software installed on it needed to run the led sign properly? Any help would be appreciated? Hey Ed is the betabrite software above is that what I may need to run stats etc?? Hey guys...does anyone here have the installation disks for ALL ACCESS PASS? Did they even use install disks for this upgrade or was this done with a thumb drive? Anyone that is running ALL ACCESS PASS that can chime in here would be appreciated. I don't have any CDs for the all access pass as when I bought the machine didn't come with them. I have cloned the hard drive so I will look to transfer to USB drive and get to u n others that have asked. As mentions by paulstevens I think the guy is either the dongle or in the registry files as the game folders contain all the courses players etc as per a normal PGA golf machine but mine allows me to play the extra courses that's the only difference. I does not allow me to play any extra players or unlock player items, tournaments etc. Which I'd really love to do!! I've been working with Paul Stevens all day on unlocking players and courses and I think we did it (players)!!! We are working on some finishing touches but I can confirm that I've golfed with both Tiger Woods and Arnold Palmer this afternoon on my stock Team Challenge machine! It's not a difficult edit at all and can be done in a matter of minutes. Be prepared to have a keyboard and mouse on hand and a tutorial will be available shortly. I will do the best that I can to write this tutorial in the simplest of terms so that everyone can follow. I recommend reading this tutorial all the way through before performing the actual steps. This method will allow you to replace any of the current golfers on the player select screen with any of the 43 golfers that are within the game! I recommend making a back up of your current PGA Team Challenge hard drive in the event something goes wrong as I will not be held responsible if any damage occurs. This should take you only a couple minutes to complete. The tutorial looks extensive but it really isn't. I tried to dumb this down so even a 6 year old could do this so please don't take offense to my attempt at simplicity. I know that I would personally want TOO MUCH information versus having to try to fill in any gaps. With that being said...here we go! Step One- Connect a PS/2 style keyboard (not USB) and a mouse (I used a USB mouse) to your PGA Tower and power it on. Step Two- Allow the game to fully load into attract mode. Step Three- Hit the WINDOWS button on your keyboard (located next to your ALT key) and a menu will open. Step Four- Use the down arrow key to highlight gvr close and hit enter. (You may have to hit the WINDOWS key again and click on CONTROL PANEL). Step Five- Click on the folder up arrow icon on the top left of the page. Step Eight- Double click the Players folder. Once opened you will see a list of players. Step Nine- Scroll through the player list and find the players.ini file and double click it to open it. Another list of golfers will be displayed with numerical values next to each golfer. Step Ten- Below is the list you should be seeing BEFORE you make any edits. I have placed the players that are currently available in the player select screen in BOLD. These will NOT be in bold on your actual screen. We can change the names associated with these BOLD numbers to any golfer we would like on this same list. For example, if I don't care to use Tiffany Williamson (Player34) as a golfer I can assign a new name (say Arnold Palmer) to her numerical value. To do this I would replace her name by erasing it with the backspace key and entering a replacement name so that it reads Player34=Arnold Palmer for example. Step 11- After changing the name from Tiffany Williamson to Arnold Palmer we will then close the window by clicking on the red "X" in the upper right hand corner. You will be asked if you want to save your changes and you will choose YES. Step 12- Hit the WINDOWS key once again and a menu will pop up. Step 13- Select gvr boot and the game will reload with your saved changes! At this point we took Tiffany Williamson's golfer out of the game and replaced it with Arnold Palmer. However, when you go to the player select screen you will notice that Tiffany is still there. That's because we aren't 100% on how to change the profile pic to represent the replacement golfer as of yet but we are working on it. When you select Tiffany Williamson and select your course, Arnold Palmer (or any other golfer you choose) will show up and will be playable while you are golfing. You can do this with any of the golfers to customize how your game plays. Personally, I will be replacing all of my fantasy golfers with golf pros. Once we figure out how to change the player profile pic and the game face overlay that is displayed during play it will be complete. PLEASE NOTE THAT IF YOU REPLACE A LEFTY GOLFER WITH ANOTHER GOLFER, THE NEW GOLFER WILL ALSO BE LEFT HANDED (EVEN IF THEY ARE NORMALLY A RIGHT HANDED GOLFER). We are also assuming that there has to be a way to allow ALL of the player numbers to be recognized in the player select screen. That would give us over 40 golfers to choose from! Have fun and if you have any ideas please contact me so that we can finish up this part of the project! Great work STP the first clear workthru n actually something that has worked not just her say. This is great. With two threads and multiple people trying to crack this game we should have it all figured out soon. Awesome work. I have all access cd do i need to just copy it to add to dropbox for ya. As for adding player pic during selection i think you will have to grab that image from the tiger woods game and reassign it in tne player art folder (?name). Has been a little while since i sat down and messed with the files. so what's up with this "all access pass" kit I keep hearing about? I realize it's an upgrade, but where does it stand in the scope of things? does it use it's own dongle or is it an upgrade that...say for example, uses the dongle from PGA chapionship edition to add additional stuff? From what I understand it has it's own dongle (USB type)? We are working on patching the additional courses from the All Access files into Team Challenge without having to do an upgrade. It's our hopes to find the structural or coding differences between the two versions so that we can find a way to unlock the courses that are already on the Team Challenge hd. All access is a patch you apply to the game. You then need an updated dongle, ours are all LPT dongles. Have yet to see a USB one. My all access pass machine has a normal white dongle just like anyone else's not USB. I'm not quite sure why that would happen. You may consider starting your own thread as it would gain more exposure to those Madden Football owners that may never see your issue hidden within the PGA Owners thread. Always wanted a Madden Football! Hope you get it resolved! Agree with stpcore - start a new thread so it gets better exposure. In the meantime, try installing a new hard drive and install the software again. Corrupted sectors can cause the program to barf back to a known good state such as the attract mode / menu. A reinstallation onto the same hard drive often is not good enough. Moving from eds thread. Got my tower back w new mobo. No more beeps but no game. Getting a note that a file can't be found on the cd rom. Can get past that and use windows to get to the exe. Next screen says usbio card is missing, or usbio card software install incomplete please make sure nitric card is is present and cabinet connected. Turn cabinet off and on after fixing or cabinet may malfunction. Any clues what I need to do. Have no discs but ordered them. Good news is at least I can get to windows! Kind of unrelated but when in windows I get the out of range display once and a while. Jeez I just want to play!!! I wonder if you have a bad i/o board? You have the USB cord going from the i/o and then into one of the other USB ports, correct? Do you also have power going to the board from your PSU? I know that the USB will power the i/o to a point but I also know that their is additional power supplied by the PSU if I remember correctly. Your losing me but I think so. Can you dumb that down?!!! I've said that more than a few times in these PGA threads over the past year! Give me a minute and I can post a couple pics for you. Page created in 0.25 seconds with 64 queries.